Window blinds are used to block sunlight, as well as to provide privacy and insulation. Blinds come in a variety of sizes and styles, and may be used on doors as well as windows. They are available in a range of materials, and many have adjustable horizontal or vertical slats. These slats may be standard, mini, or micro widths. Another type of window blind is the solid blind, which may be designed to either roll up or fold up. Slat blinds are the most common style of blind on the market. They offer simple installation, ease of use and a good blend of privacy and light control. 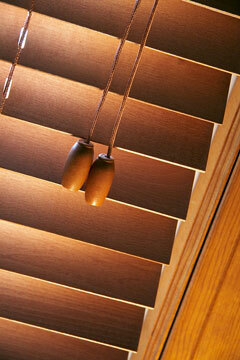 Many homes use horizontal blinds in conjunction with other window treatments such as curtains and drapes. Horizontal blinds, also called Venetian blinds, can be made from wood, faux wood, vinyl, or metal and may be finished in a wide range of colors. Optional contrasting tapes provide a decorative touch. 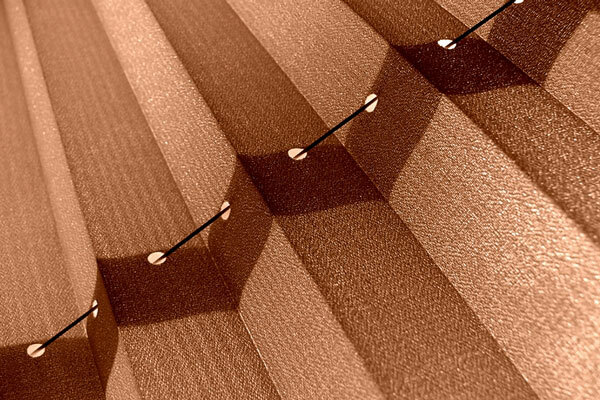 Vertical blinds are most often used with contemporary decor; they can be made from metal, vinyl, or laminated fabric that often matches office dividers or other decor components. They are primarily used in commercial applications such as offices, hotels, and apartments. The advantage of vertical blinds is that the slats may be drawn to one side, allowing access to sliding doors, French doors, or large windows. Solid blinds either roll up or fold up but cannot be opened in place to allow light through. Solid blinds are often used where decor is more important than flexibility of use and variable light control. These blinds are frequently made of natural materials such as reeds, bamboo, grasses, and rougher fabrics such as hand spun linen or flax. Window blinds vary widely in the amount of light that is let in; some let in a lot of light, while others block it completely. When choosing a window blind, it is important to think about where the blind will be used and how much light exposure is desired. Blind manufacturers usually offer traditional 2-inch slat widths, and may offer 1/2-inch micro and 1-inch mini widths as well. 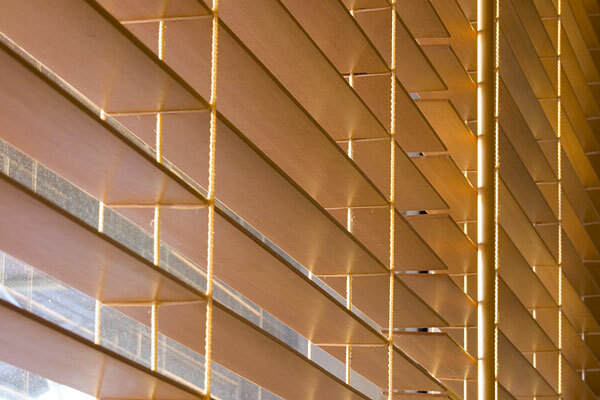 Wider slats, spaced farther apart and offering a less obstructed view, are most often used on vertical blinds. Be sure to coordinate your window blind style, color, and slat size with your room decor and furnishings. Before ordering blinds in precut or custom cut sizes, it is important to measure carefully and establish fit parameters. Traditional window blind suppliers measure your windows and doors, order or make custom fit blinds, and install the blinds in your home or office. Window blind suppliers typically offer blinds in both standard and custom sizes, along with installation instructions. Some suppliers can arrange installation services. An interior decorator can help you select window blinds that coordinate with your room decor and furnishings. Window-Blinds.us features access to selected window blind shops and window blind manufacturers as well as a window treatments designer and installer matching service. Browse through the window blind manufacturer websites for an abundance of window treatment specifications, ideas, and photos. 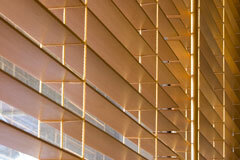 Maker of residential window coverings, including a wide range of blinds, shades, and shutters. Offers smart window fashions for stylish homes. Find cordless blinds and vertical blinds, plus cellular, natural, metal, and wood horizontal blinds. This window blind maker's portfolio of blinds, shades, and drapery hardware is designed to work in elegant harmony. Bali Blinds features blinds and shades that capture the essence of today's decorating trends. Graber Blinds offers blinds, shades and drapery hardware designed for the way people live. Custom window treatments, wood blinds, and cellular vertical blinds. Wood and vinyl blinds, PVC and fabric vertical blinds, and metal blinds. Offers motorized and manually operated window blinds and shades. This independent window coverings fabricator specializes in custom window coverings. The company features a collection of traditional blinds and shades as well as matching horizontal and vertical blinds, custom shutters, and vertical fabric blinds. This window blind vendor directory lists window blind retailers throughout the USA. Window Curtains - decorative draperies and window treatments.